Although there are many different kinds of earthworms in the world -- over 2, 700, according to the University of Illinois -- only a few types are used for worm farming in the United States. The most common of these are the red worm, also called the brandling worm (Eisenia foetida) and the West-African nightcrawler (Eudrilus eugeniae). 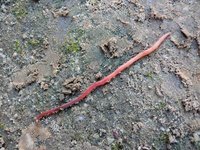 These worms have similar requirements for temperature, housing, moisture, soil and food. Generally speaking, cultured or farmed worms are not placed in soil. Instead, they are given bedding such as shredded newspaper or peat moss. Their food is mixed into this, and a small amount of soil is added to provide the grit that the worms need to be able to digest their food. The type of soil added to the worm beds, also called the worm farm, is not as important as the availability of food and the moisture in the bin, because the worms actually live in the bedding and not in the soil. Still, when adding any soil to the worm farm it is best to add a soil rich in humus, if possible, even though this is not essential. The worms can get extra nutrients from the organic material in the dirt. It is essential that the soil and bedding used for worm farming be able to hold adequate moisture for the worms. If a worm’s skin dries out, it will die. Worms are not able to live in very sandy soil, such as is found in many desert areas, as there is not enough moisture for them. Any soil used for worm farming, especially if it is used instead of bedding, must be able to hold moisture. Organically rich soils work best. If the worms are to be placed directly into soil instead of bedding, as might be done with very large worm farms, the soil should be a rich and light. It should not be high in salt and there should be no pesticides or artificial fertilizers in it. The worms will benefit from the nutrients in rich soil, but they can also live in soil that does not contain much organic matter. If the soil the worms are placed into is low in nutritional value, the worms must be fed adequately to make up for it. Ultimately the worms themselves will create the type of soil that is best for them. Worms are able to consume organic matter from the soil or from the foods that are fed to them, leaving their castings behind. While these castings are excellent for plants and greatly enrich the soil, worms that are confined will need to have fresh soil given to them periodically. In nature worms can move to different areas, but worms in a worm farm cannot. Ultimately they end up living in a container full of nothing but worm castings, which is their own excrement, and they will begin to die if this is not replaced with fresh bedding and new soil twice a year. What Makes for Good Farm Land?